You can use Google Translate to translate this post into Korean. 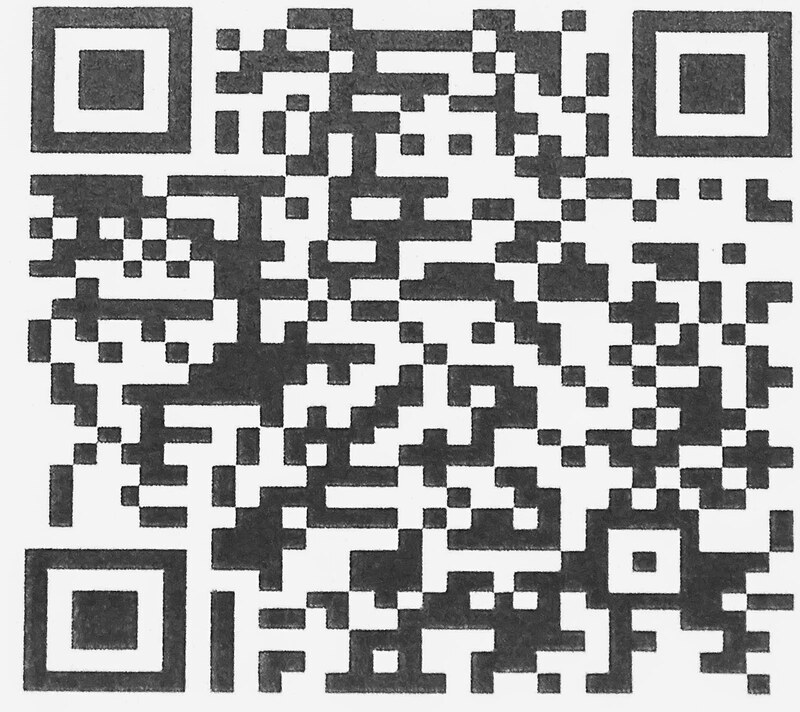 See the link on the right side of this blog. 당신은 구글이 한국어로이 기사를 번역 할 수 있습니다. 이 블로그의 오른쪽에있는 링크를 참조하십시오. Diagram indicating Korean American settlement in the United States. Image as based on the census 2000 by the U.S. Census Bureau. Genealogical research and the availability of genealogical resources in the United States have a definite emphasis on European origins. That does not mean that valuable genealogical information about other countries is not available, it just means that records from these countries are either not generally well known or are available only in those countries or in only in the languages of those countries. In this regard, FamilySearch.org is an extremely good place to start genealogical investigations in those areas of the world. This series of posts is aimed at some of those areas of the world with sizable immigrant populations in the United States that have been somewhat ignored by the European-oriented mainstream genealogists in the United States. 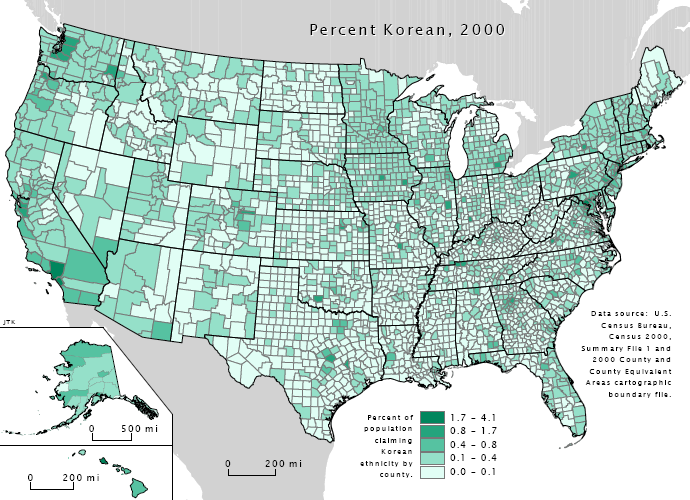 According to the 2010 Census, there were approximately 1.7 million people of Korean descent residing in the United States, making it the country with the second largest Korean population living outside Korea (after the People's Republic of China). The ten states with the largest estimated Korean American populations were California (452,000; 1.2%), New York (141,000, 0.7%),New Jersey (94,000, 1.1%), Virginia (71,000, 0.9%), Texas (68,000, 0.3%), Washington (62,400, 0.9%), Illinois (61,500, 0.5%), Georgia (52,500, 0.5%), Maryland (49,000, 0.8%), and Pennsylvania(41,000, 0.3%). Hawaii was the state with the highest concentration of Korean Americans, at 1.8%, or 23,200 people. According to the statistics of the Overseas Korean Foundation and the Republic of Korea's Ministry of Foreign Affairs and Trade, 107,145 South Korean children were adopted into the United States between 1953-2007. Of course, the Korean Peninsula is divided into two completely different countries; North and South Korea. The political situation in North Korea makes doing research inside of that country very, very difficult, but South Korea is a different matter. To begin your research in Korean genealogy, you should go to the FamilySearch.org Research Wiki article on South Korea. Links on that page will take you to several valuable online resources. By no means is the information in the Research Wiki complete, but it is a good place to begin. I also suggest the Korean Studies portal from Brigham Young University. You should also be aware of the assistance of Google Translate for those researchers who need help with the Korean language. The Korean Genealogy Guide helps English speakers interpret Korean family registers (JokBo). It serves as both a reference and instruction guide on Korean writing (HanGul and HanJa), names, numbers, dates, history, and genealogy vocabulary. It includes examples of how to interpret the structure and content of Korean family registries to discover ancestors. It also instructs how to use internet resources to find and interpret Korean genealogical records. It is too bad that I do not speak Korean, but I do know how to do research in almost any language and place. From my perspective, genealogy is genealogy. There are certain things you need to know about doing research in any area. If I were going to get started with Korean genealogy, I would begin by getting the book cited above and reading it all the way through. I would also learn the Korean script. If you already know both of these, you are on your way.